Oh dear, it looks like Tower Hamlets council’s First Class director of schools and children has been at it again. Just a couple of months after I revealed she had spent £427.50 of our money travelling first class on a train to Manchester in July, we now discover more of her reluctance to mix it with the great unwashed who pay her £116,000 a year salary. 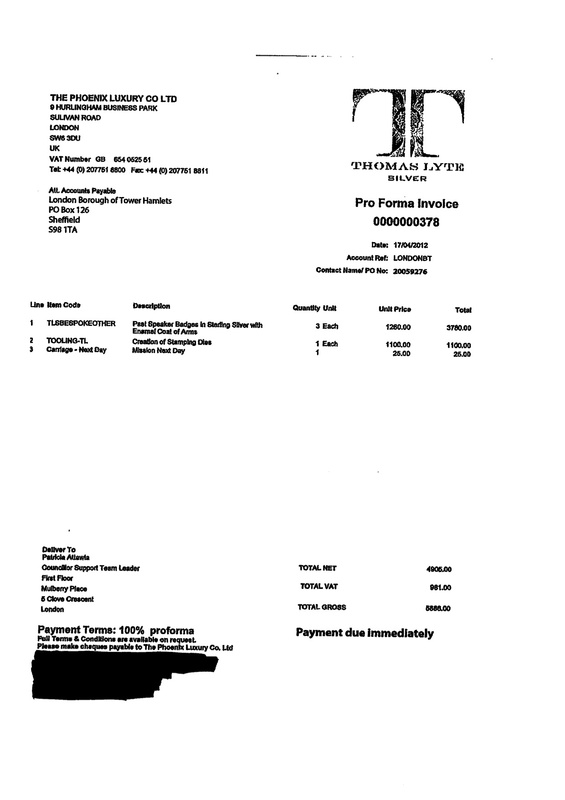 Another answer to a Freedom of Information request here reveals she was given a £216.50 first class ticket to Nottingham on September 7 to speak at a “London Leaders” conference for something called the Virtual Reference Group. I’ve no idea what that is. There are many reasons why people like to travel first class. One of them is because they need somewhere quiet to work. That was the reason offered by George Osborne after he was caught out travelling in style last month. The Chancellor, of course, is the man being blamed by the likes of Isobel Cattermole and her council colleagues for cuts to children’s services. Isn’t it a bit worrying that someone at her level seems happy to spend budgets on herself while cutting it for others? After my Manchester revelations, councillors forced Ms Cattermole to repay the difference between the standard fare she was entitled to and the first class she took. During their searches, they also spotted this Nottingham train trip because she’s had to repay that too. For the record, a standard class fare (including a seat in the Quiet Coach where it’s also easy to work in peace) would have cost about £74. Meanwhile, the trust FoI tool has also shed some light on other intriguing transactions. That’s £1,260 each for three little silver pin badges awarded as a memento to those who have been the Speaker/ceremonial mayor for a year. Apparently, some then sell these gifts on eBay. 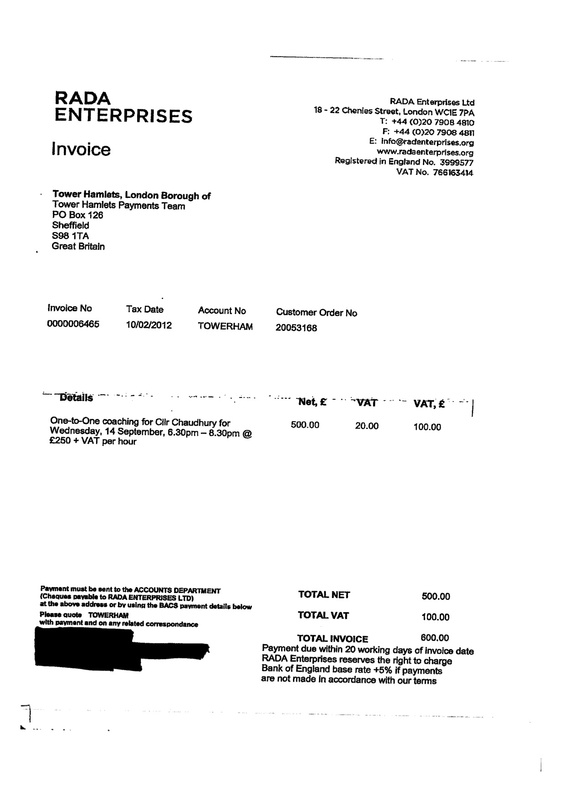 That’s £600 to the world famous acting college RADA (Royal Academy of Dramatic Art) on behalf of the last Speaker, Labour’s minicab king Cllr Mizan Chaudhury. Yes, that’s right £300 an hour. The council tells me he requested the training so he could improve his public speaking. Well done, Ted. Keep the good work up! I’ve said it before and I suspect I’ll say it again; piggies, snouts in the trough so deep their tails are all that is left showing. I’d disagree with your statement that it’s £1260 per pin badge Ted; that looks to me like the “Creation of stamping dies” relates to those badges and to those badges alone. Count in the carriage and VAT (as you did for the Chaudhury/RADA invoice) and it’s £1963 per badge. I wonder how much they fetch on eBay? I obviously don’t agree with people in Ms Catermole’s position behaving like that. She may well need somewhere quiet to work, but she is very lucky that she is paid enough for First Class to be an option for her, without having to break the bank. I thought that was what high salaries were for. If on top of the salary, we give such officials everything they could potentially spend their salary on for free, then what is the point of paying them so much? As for Osborne, for him to use that excuse is absolutely staggering. A quiet place to work? Really? He didn’t seem to be doing much work in the photos I saw. According to the journalist on the train who reported the incident, he was jiggling around like a juvenile idiot, laughing his head off at some DVD he was watching with his secretary and disrupting the decorum of his fellow First Class passengers. The pin badges are a shocking waste of money at any time, but in particular during the current economic climate. A quick google for “custom made sterling silver pin badges” does suggest us local council tax payers have been ripped off. Mind you if you buy them from Aquascutum (who trade as Phoenix Luxury Company Ltd) then what can you expect? Perhaps our Mayor buys his “mayoral” fruit and veg from Fortnum and Masons. If you used all the copper in Ol Flo then how many sterling silver pin badges could you make? I’ve a question about comments here. How long, after the original article, can we add to a comments thread before it ‘closes’. The settings were set in WordPress to 14 days but I’ve now increased that to 40. Which thread did you want to add to? Ted, check the following link and ask Mr Jubair as a chief reporter of channel S why he deliberately did not cover this story. This convicted murder has been working as a teacher and Imam in Tower Hamlets for last 11 years. Mr Chowdhury has also been working as a presenter with Bangla TV, he presents a programme called “Masala Masail” every Sunday at 9:30pm. Despite the story was reported by four national news papers and most people in the Bangladeshi community are fully aware of this TRUE story. However, non of the 20 something Bengali weekly newspapers and 6 TV channels deliberately very conveniently avoided reporting this serious story. I am also surprised that the East London Advertiser failed to cover this serious story. When you were at East London Advertiser you were a champion of exposing such criminals. You should do your own investigation and run a story on your blog then many illegal activities of his employer will come out. I am not sure if you all know this but Jubair was already hired by the Mayor months before they put out the advert to take on a communication advisor, so this tender was all a scam! It might be timely to remind certain TH members and officials of the “Seven Principles of Public Life” which apply to ALL public service appointments: these are a statutory requirement.